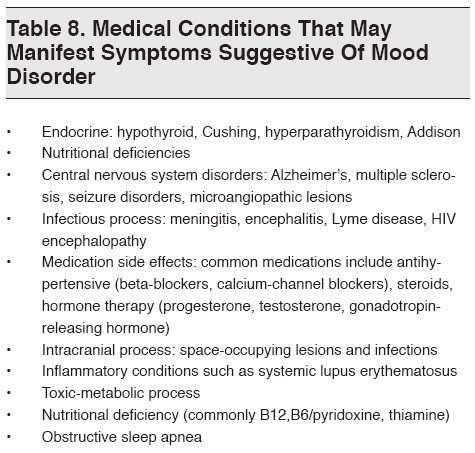 The differential diagnosis for MDD is broad and can be thought of from the framework of differential mood disorders (ie, other Axis I disorders that present with depressive symptoms) and depressive symptoms secondary to an identifiable medical cause. In addition to major depression, there are other types of mood disorders that manifest in the ED. While it is not expected for the emergency clinician to have memorized the DSM-IV-TR criteria for all such mood disorders, it is critical for the emergency clinician to be aware of the diversity in the spectrum of mood disorders, as it may have significant implications for evaluation and ultimate management in the ED. 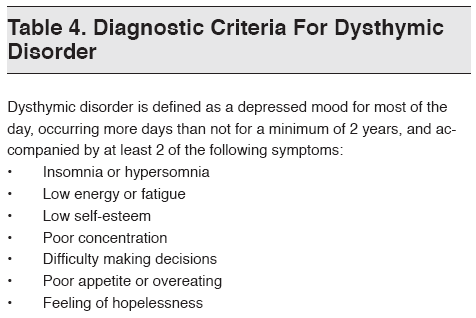 Among the critical mood disorder variants seen in the ED, the following are of note: dysthmia, adjustment disorder with depressed mood, bereavement, depressive disorder not otherwise specified (NOS), bipolar disorder, and mood disorder secondary to a medical cause. A brief discussion of these disorders follows. Adjustment disorder is characterized as a development of emotional or behavioral symptoms in response to an identifiable stressor (or stressors) occurring within 3 months of the stressor. (See Table 5.) In the setting of this adjustment disorder, patients may also manifest some aspects of clinical depression. 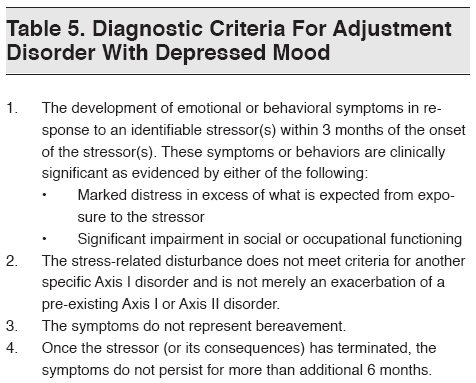 The key aspect of adjustment disorder with depressed mood takes place within the context of an identifiable stressor, and as such may differ in terms of management strategies. 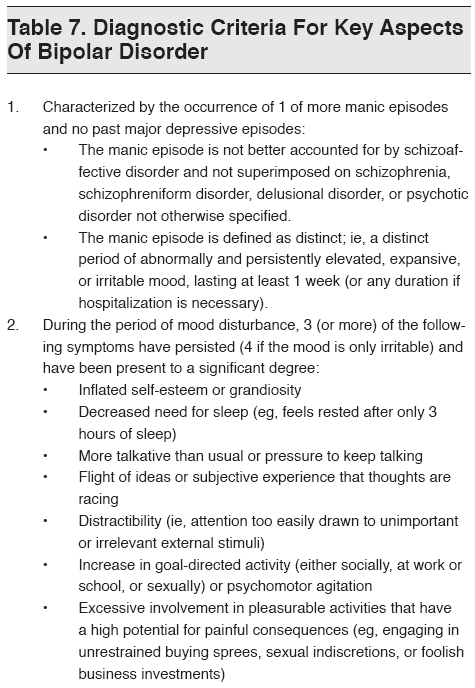 An awareness of this mood disorder in the ED may be useful for both the emergency clinician as well as any potential consulting psychiatry service in identifying tailored management strategies. Patients may present to the ED with depressive features that do not meet criteria for the aforementioned mood disorders (ie, major depressive disorder, dysthmic disorder, adjustment disorder with depressed mood, or bipolar disorder). Such patients may be classified under depressive disorder not otherwise specified. Variations include premenstrual dysphoric disorder, minor depressive disorder, and post-psychotic depressive disorder of schizophrenia. The key aspect of this diagnosis is the recognition that while some patients may not meet criteria for all of the characteristics for a specific mood disorder, the emergency clinician should maintain a high degree of suspicion for further evaluation and management for patients endorsing some features of a depressed affect symptomatology. Enter your email below to get evidence-based updates delivered to your inbox once a month.